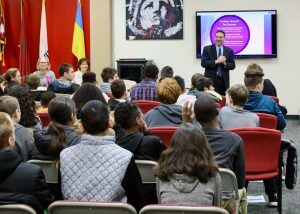 Reading, PA – Have you ever heard a student say, “How will I ever use this in the real world?” On Friday, November 30,th over 500 8th grade students from Wilson West and Wilson Southern Middle Schools attended a career day on the campus of Reading Area Community College to help answer that question. 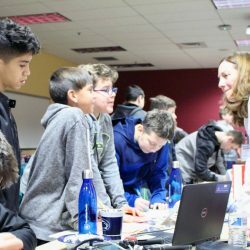 Students had the opportunity to learn about careers in the fields of science, business, technology, engineering and the health professions. In addition, representatives from dozens of local businesses and institutions were on site to answer questions about their field, and what training or preparation is needed to enter those industries. Director of admissions and enrollment services, Dr. Abigail Wernicki, says the event is a great way to introduce students to career options and connect them with professionals and faculty who are eager to guide them toward their next steps.